So there was not much reading accomplished in May. The month started out really well. I finished up my first book only a couple days in, but the next two I picked have been deeper and heavier. But, let me tel you what I thought of the two I did read. 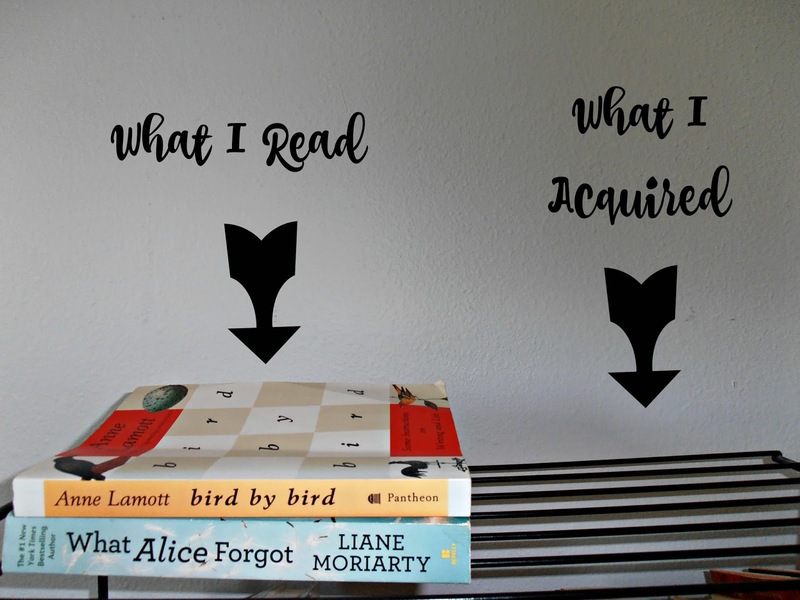 What Alice Forgot by Liane Morarty was the first of Moriarty's books I've read and I wouldn't be opposed to reading more. I would classify this as a beach read. There's a little bit of a mystery, a little soul searching, and some reflecting, and a nice resolution at the end. The premise is that Alice wakes up after falling off her spin bike at the gym and hitting her head only to discover that she doesn't remember the last ten years of her life. 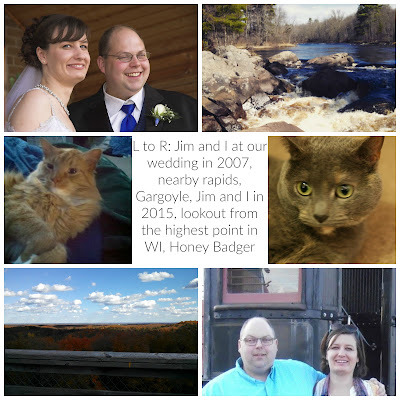 The last thing she recalls is being happily married with a baby on the way, with her and her husband remodeling their dream home. Now she finds out she's getting a divorce, her sister barely talks to her, her shy, quiet mom is remarried and a salsa dancer, and she has three kids! It's a good read and it was interesting to find out what happened in the missing chunk of time. I wasn't sure how it would end, but as a lover of happy endings, I enjoyed it. 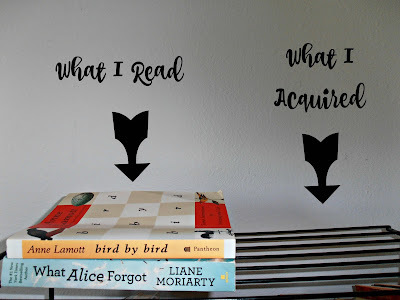 Bird by Bird by Anne Lamott is taglined as "Some Instructions on Writing and Life" and I'd say that is true. I feel like Anne Lamott would make a great best friend. She'd tell you the truth with humor, always be encouraging, and have a fun way at looking at things. This book really inspired me to get back to writing just for the sake of writing and find my voice. She also gave me new insights and presented a different way of looking at things. Her sense of humor shines through every page and I found myself laughing out loud more than once, and quoting passages to friends and then listening to them laugh out loud. I took longer to read this book than I should have, but I really wanted to soak it all in and once I was finished, I felt like I should immediately go back and reread it, highlighting and underlining pertinent parts, but I'm afraid it would be covered in yellow highlighter and notes in the margins. I highly, highly, recommend it to anyone who wants to write but isn't sure how to begin, as it gives practical advice for writers of all levels without regard to skill. It's definitely a keeper. I started a third book, about the Rwandan genocide, and am still trudging through it. It's hard because it's full of inhumanity and terror and the history of an area I know little about. It's well written, but definitely not enjoyable or light. Hopefully, I will finish it in June and can tell you more about it next month. As for what I acquired- look at that! Absolutely nothing new! Feels great to not add more to the to be read pile. And what about you? What are you reading or adding to your reading list? Let me know in the comments below.